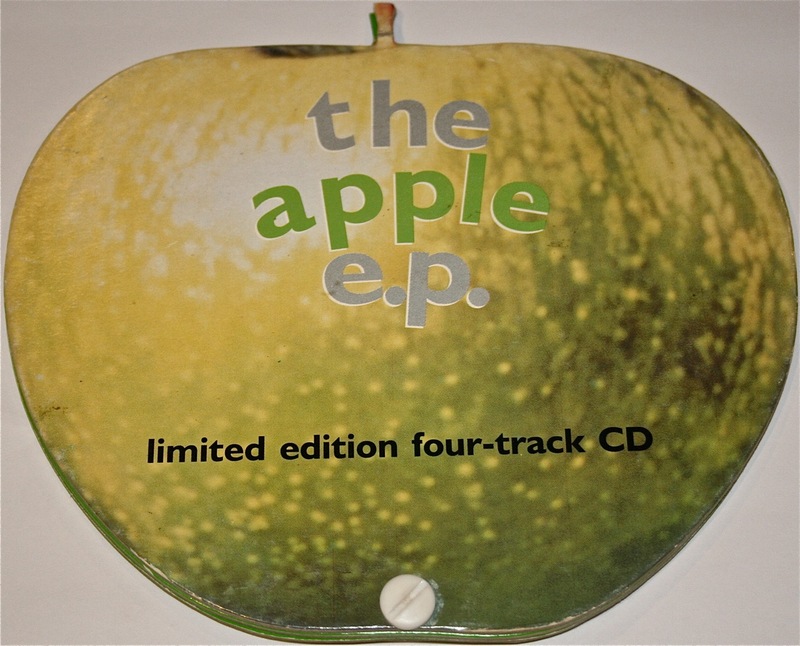 Beatles USB Apple – not the First Apple-shaped Product Released…. I’ve always had a fascination with the Beatles and their music. From the very first days of being old enough to buy my own records I’ve had at least some copies of their albums and singles in my collection – mostly vinyl, starting with Sgt Pepper, The White Album, Abbey Road, and Let It Be, plus the odd single here and there. In launching Apple Records in 1968 the Beatles produced what was then and is now an exceptionally rare promotional box-set of the very first Apple singles called “Our First Four”. According to Richard DiLello in “The Longest Cocktail Party”, his 1972 memoir about being an Apple Records “house hippie”, this was a presentation box containing the first four 45 rpm vinyl singles from the label. 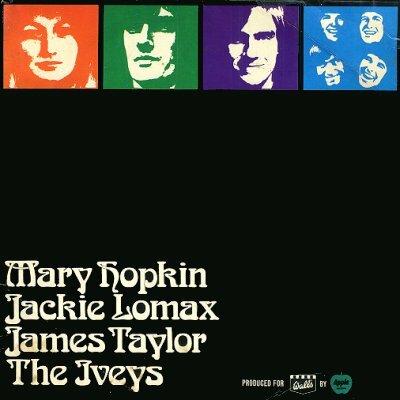 It was “….a box made of plastic, 10 by 12 inches in matte black with a recessed lid carrying the Apple sticker that announced it as Our First Four, 3 Saville Row, W1.” It contained The Beatles “Hey Jude/Revolution” (R 5722), Mary Hopkin – “Those Were the Days” (APPLE 2), Jackie Lomax – “Sour Milk Sea” (APPLE 3), and The Black Dyke Mills Band – “Thingumybob” (APPLE 4). Richard DiLello again: “There was a single coloured folder containing the biographies and photographs of the artists with the records in a polythene sleeve. The name of the person to whom the box was going was printed on the outside Apple sticker. This was primarily an inter-industry gift presentation package for the benefit of Capitol Records and selected disc jockeys and journalists.” Here’s a website that has a photo of one of these extremely rare boxes – although I’m not sure how authentic it is. DiLello says in his book that one of these boxes was presented to Stanley Gortikov, President of Capitol Records in 1968. Others were hand-delivered to the Queen Mother at St James’s Palace; Her Majesty the Queen at Buckingham Palace; Princess Margaret at Kensington Palace; and to British Prime Minister Harold Wilson at Number 10 Downing Street, London. 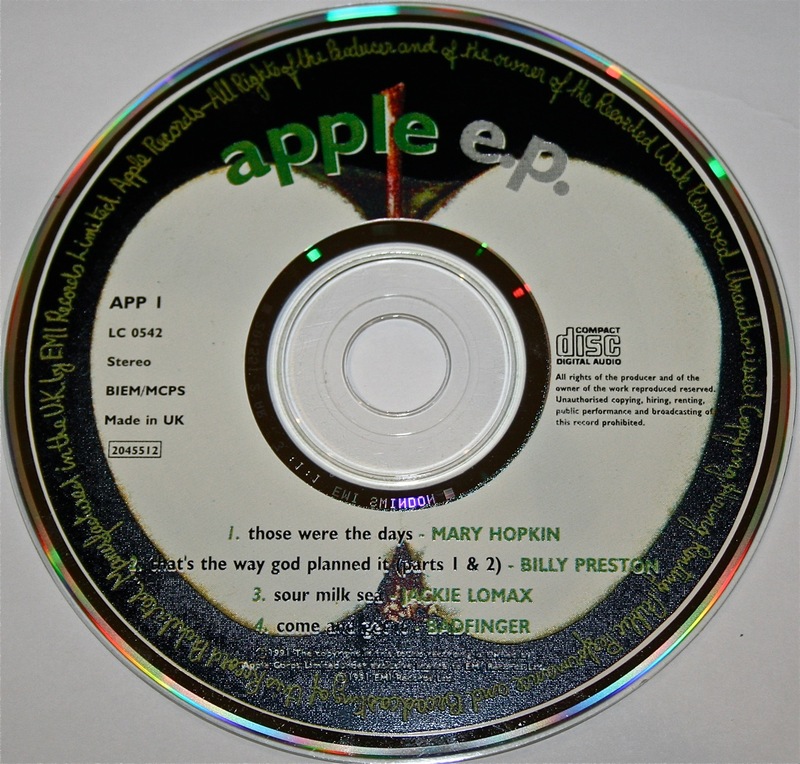 In 1991, when it came time for Apple to conduct a big re-issue program of all the Apple album releases, they decided to do something similar (but not exactly the same – and certainly not as rare) with a special Limited Edition CD. 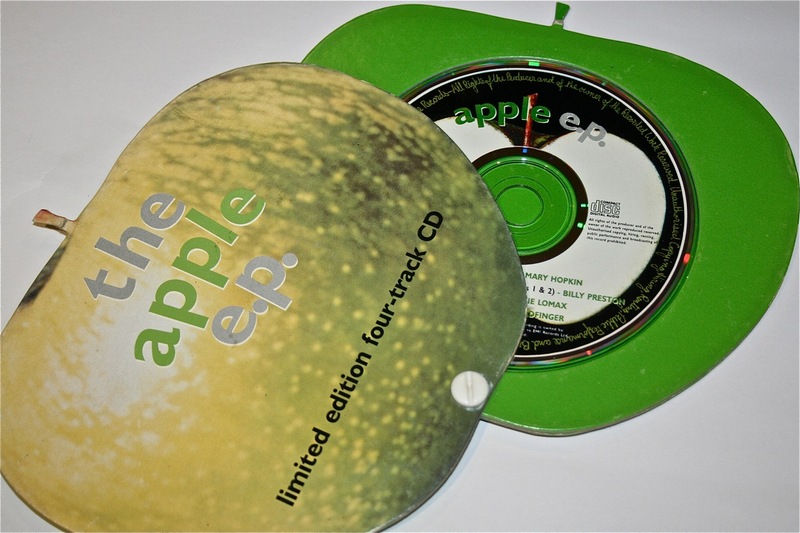 As you can see it’s an official, apple-shaped CD release to mark the re-issuing of the Apple LP catalogue on both CD and vinyl – back in 1991. As well tracks 1 and 4 were produced by Paul McCartney, and tracks 2 and 3 were produced by George Harrison. OK, so there is no “Hey Jude”/”Revolution”, but there is still a pretty large Beatle quotient here. 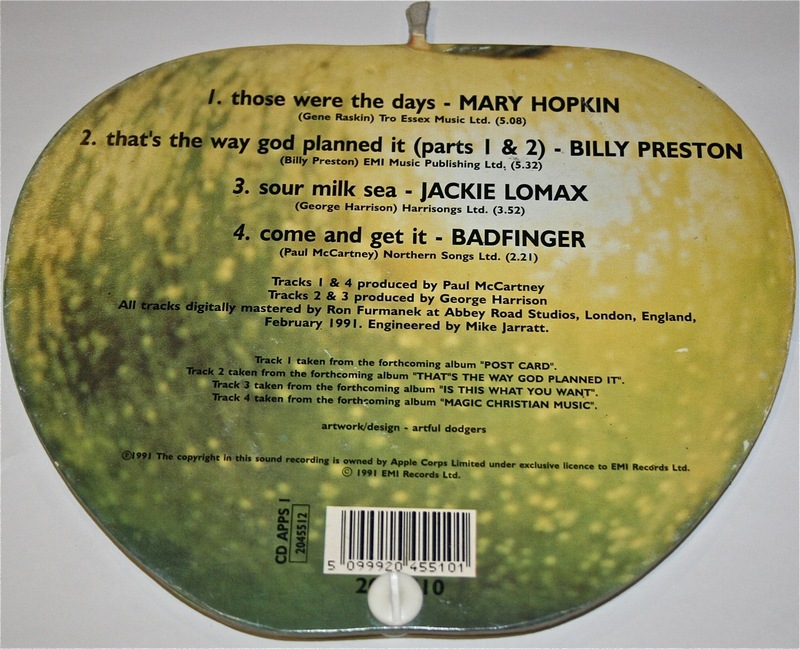 And for me its a reminder that the current Beatles USB (containing all the remastered Beatles albums in high quality digital format) is not the first time that Apple has used an apple-shaped object to market product. Click here for more information on this release. As for the Apple re-issue program from 1991, I have quite a few of the vinyl LP re-issues from that time (complete with bonus tracks and original and additional artwork) and will post some pictures and info on these in the future. This entry was posted in Beatles, Beatles Collecting, Beatles Music, Beatles Related, Rare Beatles and tagged Apple Records, Badfinger, Beatles, Beatles Collecting, Beatles Related, Beatles USB, Billy Preston, Hey Jude, Jackie Lomax, Mary Hopkin, Our First Four, Rare Beatles, Richard DiLello, The Longest Cocktail Party, Walls Ice Cream by beatlesblogger. Bookmark the permalink. You might also be interested in the post I did on Ken Mansfield’s “The White Book”, in which Stanley Gortikov gets frequent mentions.